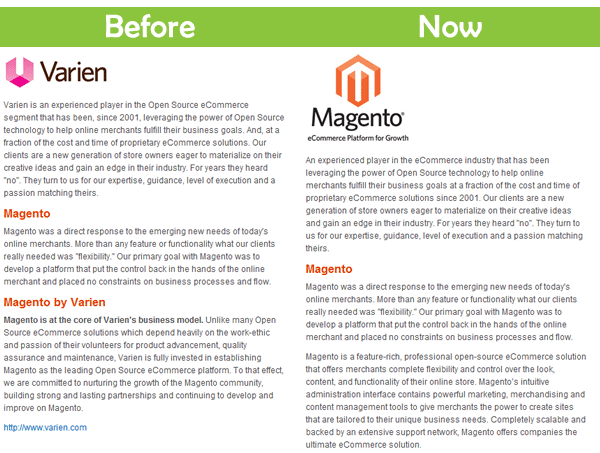 Varien is now Magento Inc. While I was checking today some Linkedin profiles, I noticed the fact that some people abandoned Varien. For those of you who don’t know, this is a company that created Magento. I’ll be honest and say that I had a moment of fear since our business is closely tied to Magento success. My worries went away the same second when I clicked on varien.com link. The step is logical. Since I’m working with key accounts recently, I was using part of sentence “Varien, company behind Magento” quite often. The fact that Magento is open source and yet, there is a company who developed it, was confusing for some people. Especially for those who came from the osCommerce world. Uniting the name will definitely bring more clarity to the story and corporate branding will be smoother and effective for Magento Inc. Good luck guys, to you and your 115+ employees.